There is a new free application available for download in Freeware section. 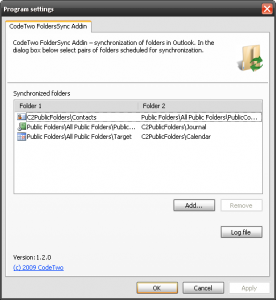 The solution is CodeTwo Folder Sync Addin and can be used to synchronize data between folders in Outlook. The work of the tool is simple: you first set the pairs of folders in Outlook of the same type you want to synchronize. Next, you use a button in Outlook toolbar to initiate a sync. This is useful if you want to make sure that once any item is added to a folder such as a calendar, contacts or mail folder, this item gets copied to another folder that is paired up with the original one. The tool gets most attention from users of CodeTwo Public Folders as it allows synchronizing the contents of public folders with the personal with one click and without resorting to clumsy copy functionalities where you would have to highlight all items to be copied. Interestingly, once the personal folders are updated with the data from the public folder, the information can travel further to your PDA, Blackberry. 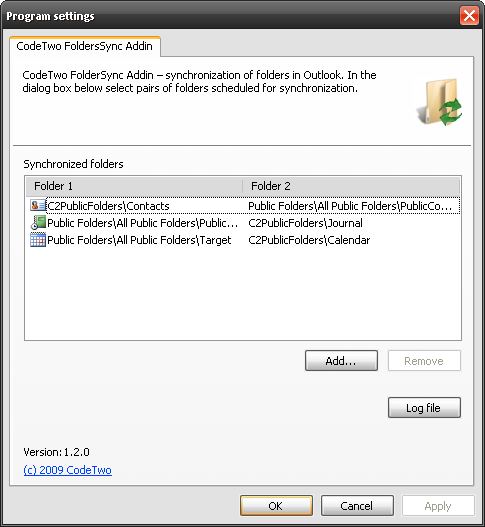 This makes CodeTwo Folder Sync Addin a significant extension to CodeTwo Public Folders. The best part is that it is totally free. In August 2009 CodeTwo released an application called CodeTwo Exchange Sync. It is a program that can synchronize folders directly on Microsoft Exchange server. The synchronization process takes place in real time without users? interference. All changes made by users in monitored folders are instantly copied to folders previously selected by an administrator.